Flintloque fans! 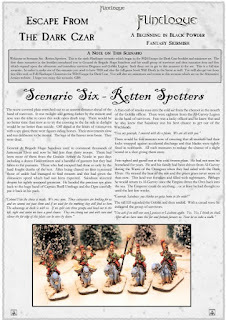 The sixth scenario in the Escape the Dark Czar arc is now online for free download. Click through for the download link and see if you can capture the fleeing Elves and Goblins as you take the part of a Savant Zombie officer on horseback in 'Rotten Spotters' a solo or two player adventure. It makes use of the brand new Undead Cuirassier cavalry as well as the miniatures in the great value beginners box set. Thanks for your support!